Offering direct access to McCormick Place, this hotel is a win for meeting planners. Learn the fascinating history behind some of Chicago’s leading hotels. The hip boutique hotel debuts in Chicago's trendy West Loop neighborhood with an impressive restaurant and rooftop bar. Book your next meeting or attendee lodging at these tech-focused spots. 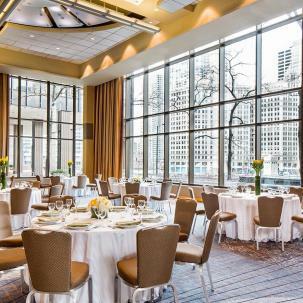 Four of Chicago’s premier hotels have united to better serve corporate meeting and event planners. The experts at three historic Hilton hotels help meeting planners deliver a successful Chicago mini-wide event. The stylish new Chicago hotel opens in the upscale Gold Coast neighborhood. Stay in the lap of luxury at these TripAdvisor five-star Chicago hotels. Six downtown hotels have come together to form the River East Collection, ideal for small to mid-sized meetings in Chicago.